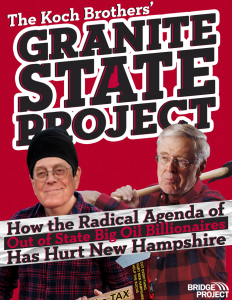 Today, Bridge Project is releasing a new report, The Koch Brothers’ Granite State Project: How The Radical Agenda Of Out Of State Oil Billionaires Has Hurt New Hampshire, which lays out the scope and motivations of the Koch network’s actives and influence in the Granite State. The Koch brothers’ deep roots in New Hampshire, which date back to the 1990s when Citizens for a Sound Economy, which later became Americans for Prosperity, advocated privatizing Social Security. How nearly every single Koch front group is active in New Hampshire including Concerned Veterans for America, Generation Opportunity, The LIBRE Imitative, 60 Plus, Concerned Women for America, and others. AFP’s New Hampshire chapter’s relentlessness in pushing the Koch agenda through their pledge to uphold the Koch agenda, which has become a must do for candidates at the federal, state, and local level. AFP-NH’s long record of pushing the Koch agenda, no matter how much it hurts New Hampshire, including campaigning against Medicaid expansion, advocating for cuts to LIHEAP, and running huge, multi-year campaigns to push the Koch position on environmental policies. The Koch network’s close ties to the Free State Project as well as AFP-NH’s history of working with the fringe group to promote the Koch agenda. Granite Staters’ record of rejecting Koch influence where they see it, including in the 2014 Senate race between Senator Jeanne Shaheen and former Massachusetts Senator Scott Brown. The deep Koch ties of New Hampshire Republicans including Senator Kelly Ayotte, gubernatorial candidate Chris Sununu, Congressman Frank Guinta, and potential Congressional candidates Pam Tucker, Rich Ashooh, and Jack Flanagan. This week, Bridge Project is on the ground in New Hampshire to roll out the new report and briefing activists and partners on how the Koch agenda hurts New Hampshire.